My intention was to spend all this month working on my twenty-first novel, The Unselfish Uncle. I even signed up for NaNoWriMo to help push me to finish the novel quickly. She threw in a few other comments, all of which shamed me into putting aside Unselfish Uncle for a couple of days and turning my attention to this website. So I started checking the links, the pages, whatever is here, and discovered that she was right. The site was not in good shape. It needed a lot of work. That’s the problem with websites. They don’t take care of themselves. They are like infants, in that respect. They’re cute sometimes, but at other times they need to be cleaned up and made adorable again. So, for the past three days, that’s what I’ve been doing. I’m sure if I was a professional web designer, it would have taken me a lot less time. But I sort of have to re-learn how to use the site each time I and told to fix it up. The learning process is good, but I regret the time lost (or invested, if I’m going to be a glass half full kind of girl). But, most of the site is up to date at this point. However, I discovered that my latest books are not uploaded to several distribution channels. I’ve got to invest (spend, since I’m also a glass half empty kind of girl) some time in uploading my books to these channels. But I also have to get back to writing Unselfish Uncle. I’m not sure if I can make up the lost word production for the past three days or so, but I will try. But that’s the joy of writing. You get to play around with all these characters, making them dance to your tune. Well, most of the time. I often discover that characters in my story have minds of their own and frequently take my story in directions I didn’t fully expect. So, time to get back to work. And not worry about elections for another two years. I have been asked where I get my ideas for my murder mysteries. The answer is never easy, since there are multiple sources for ideas. Most of the ideas come from my own imagination, where I contemplate how I would get rid of this person or that person, and what conditions would make this action seem like a plausible course for me to follow. Not that I ever would, of course. I may be murderous on paper (or screen), but I am unlikely to ever carry out my fantasies. Most crimes come out of situations where some of the main motivators of human behavior come into play. Everyone knows these motivators: protecting yourself, protecting your family, anger, hatred, greed, jealousy, fear. There are some motivators that I am less familiar with: political rage, religious zealotry, social outrage. And there are some motivators that I won’t admit to being familiar with: paranoia, psychopathy, delusional rage. Yet all of these are possible reasons for murder in my stories. And that’s what make writing mysteries interesting. I get to go into the minds of characters who have these motivations and try to make them real and believable. As for the murders in my stories, they all come from the challenge I’ve given myself: to write a murder for each letter of the alphabet. I come up with the title of the story, then try to find the motivator that would fit that scenario. Here is an example. When I first planned the series, one of the last books in the series was ZZ. At first I was going to call the story The Zealous Zookeeper. My challenge was to find a situation in which a zookeeper would be involved in a murder. My earliest ideas focused on someone who so loved their collection of big cats that they killed and ground up occasional visitors to the zoo to provide food for his beloved cats. 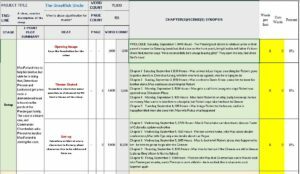 In the previous post, I described how I use Post-Its to work out the details of the plot, focusing on what MacFarland is doing, what others are doing, and key events that might affect the plot. The number of details I include in this phase varies from book to book, but some general guidelines apply. Since the Hot Dog Detective Series typically has 70 chapters plus a Prologue and an Epilogue, I will have a minimum of seventy two Post-Its. I also have to have an average of another 70 Post-Its that follow the police, the antagonist, and others in the story. Sometimes it is more important to know what these secondary characters are doing, since mistakes or omissions in their plot structure can ruin my story. The last thing I want to do is have a story with a broken plot outline. I do admit that I often overlook some things that go on during a crime investigation. For example, I don’t always show the role that the press and media play in an investigation. If I were writing a more realistic crime novel, I don’t think I could get away with this omission. Nor do I include all the activities of the police department. For the sake of simplicity, I often focus on only a few of the individuals involved in solving a crime, whereas reality would recognize that there are literally dozens and dozens of people involved in even a simple homicide. Nor do I describe the complex interactions of many different jurisdictions and policing entities that often get involved in solving a crime. I am writing a story that is designed to entertain, not describe in extreme detail the procedures of a police investigation. But…getting back to plotting the story. I take the Post-Its and now determine which of these are scenes that will be included in the story. Since my stories are from MacFarland’s perspective, I only include Post-Its that describe what is happening to MacFarland. I now determine the time of day these events occur and put them into the Blake Snyder outline that I use. A copy of a portion of this outline is shown below. Setup – The Setup beat includes three components: the Opening Image (in which I put the Prologue of the story), Theme Stated, and Set-up. In the Theme Stated beat, I try to describe the general emotional and developmental issues that MacFarland is facing. In the Set-up beat, I lay out the basic murder conflict issues that MacFarland must deal with. Turning Point 1 – The first Turning Point includes two sections: the Catalyst and the Debate. In the Catalyst, I have scenes that show how MacFarland gets incentivized to solve the mystery; in the Debate section, I try to have scenes that bring up some of the competing issues in solving the case. In this section, I often introduce other potential suspects, reasons to doubt the original assumptions MacFarland has made, and potential competing interests other characters might have in solving the crime. Act II Part 1 and Pinch Point 1 – This portion of the Blake Snyder beat structure includes three sub-sections. Act II, in which there is a dramatic shift in the plot. The investigation becomes more serious for MacFarland or the forces arrayed against him start of emerge. In the B-Story, MacFarland’s (or someone else’s) emotional attachments come into play, either helping MacFarland pursue his investigation or set up a roadblock to his easy resolution of the case. In the Fun and Games section, we get to play with the emotions of the main characters, setting them up for getting closer to each other, or encountering emotional barriers that thwart their “happily ever after” goals. Midpoint – The Midpoint is just that…getting back to the goal of solving the crime, or introduction of a false solution or a possible set-back. Act II Part 2 and Pinch Point 2 – This section of the Blake Snyder beat structure is all about things getting worse. It consists of three sections: The Bad Guys Close In, All is Lost, and Black Moment. The scenes included in these three beats are all pretty obvious. The early successes MacFarland has had are thwarted as forces are arrayed against him. Turning Point 2 – In the second Turning Point, the issues and individuals identified in the B-story combine with the main story to hint at a possible solution. This collection of scenes often represents the inflection point in the story. Act III – Act III has two major beats: the Finale, in which MacFarland finally confronts the killer and solves the mystery; and the Final Image, in which all of the loose threads of the story are resolved. This section also includes the Epilogue, which is a fore-shadowing of what is happening in the next portion of the over-arching trilogy story. I try to have five scenes for every beat or sub-beat of the Blake Snyder outline. 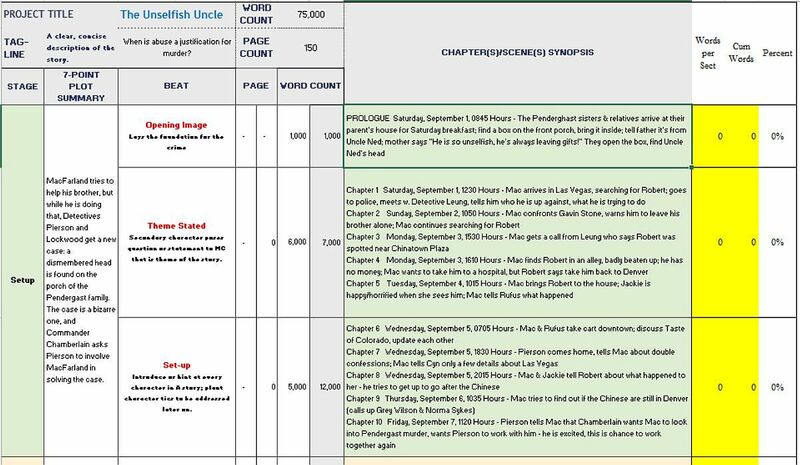 Each scene will average 1,000 words, which makes the scene short enough for the average reader to race through. Some authors will find my approach to writing a mystery story as too mechanistic. I am sure that there are other approaches that work just as well for others as this does for me. But with this approach, I am able to write a novel every 45 to 60 days. Are they great novels? I don’t know. That’s for my readers to decide. Are they fun to read? Again, you have to ask fans of the Hot Dog Detective series. For me, the most important question is, are they fun to write? My answer to that question is unequivocally, yes, they are! And that’s what keeps me going.